Notes: The colour of the disc is bright orange (in stark contrast to the monochrome black and white design of the rest of the cover and sleeve) with no title information on it beside basic copyright information. Notes: There is a catalogue number discrepancy between the disc and the sleeve. The correct catalogue number is displayed above. 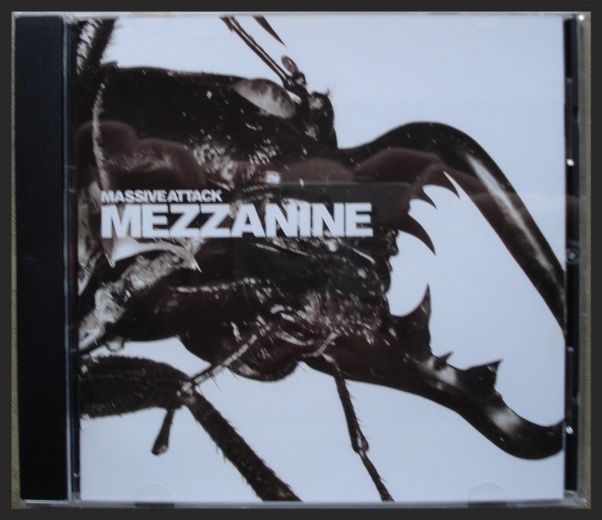 Many of the first sold copies of this limited edition version of Mezzanine, when sold in UK record stores also came with promo sampler CD's for Massive Attack's Melankolic record label. The artwork in the inner sleeve of this release differs slightly from the regular version's artwork. Notes: This was the first and only Massive Attack Japanese album release to come with a bonus track attached to the end of the regular album, which is a common practice for Japanese releases. In this case it would be Superpredators, which had already come out last year as a b-side to the Risingson single. Notes: This re-issue was part of the "Modern Masters" Re-issue series. 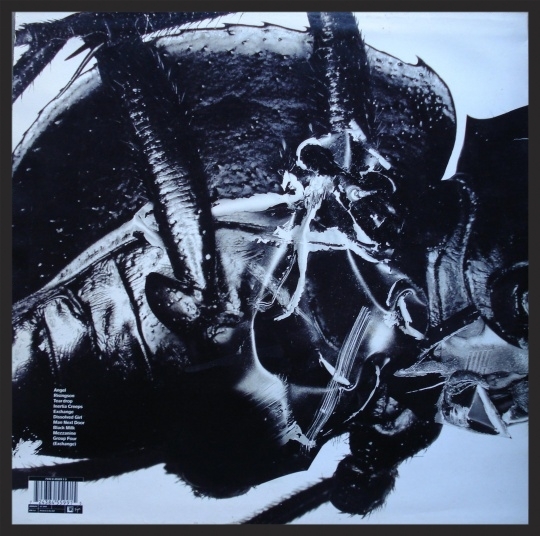 Three other Massive Attack albums, Blue Lines, Protection and No Protection would also recieve similar Japanese re-issues in deluxe Mini-LP sleeves. Notes: First Massive Attack release from Taiwan. Notes: Of all of Massive Attack's albums released on vinyl this is probably the rarest and most valuable one. Standard vinyl with a inner groove which is printed in a bright orange label (in stark contrast to the monochrome black and white design of the rest of the cover and sleeve). 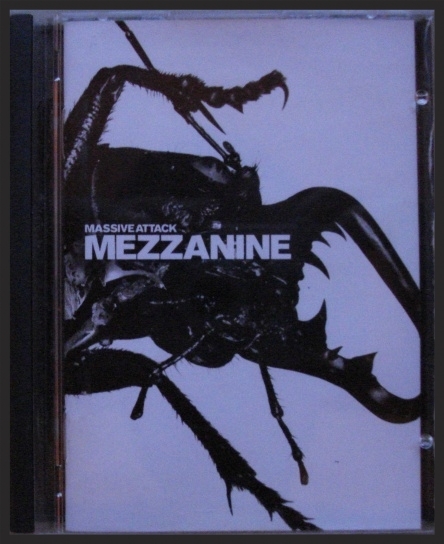 Notes: This is only one of two minidiscs that Massive Attack would ever release with the other one being Blue Lines, which were also released on the same day as Mezzanine in the UK. Notes: The artwork on the actual disc of this promo release differs distinctly from all the other releases of Mezzanine by having a red colour. Notes: Identical to the USA Retail version of Mezzanine except for the promo stickers. Notes: The only Canadian promo produced to promote Mezzanine. Contains promotional details about the release of Mezzanine and Teardrop on the back insert. Notes: Similar to the first Japanese promo cassette except this one includes Superpredators as a bonus track, much like the retail Japanese version of Mezzanine. Notes: The inner paper leaflet in this promo sampler gives information about Massive Attack and the new Mezzanine album which is written in Taiwanesse. This sampler repeats it's 4 album tracks two times over, creating the 12 track long sequence found on the tracklisting below. Packaging: European Retail Issue Of Mezzanine Wrapped In A Transparent Plastic Sleeve Along With a 4 Page Info Flyer Promoting the CD/VCD series. Notes: This bonus VCD was given away for free with very limited copies of Mezzanine back in 1998 as part of the CD/VCD series from EMI artists. This is the only instance of a Massive Attack release on the VCD format. Notes: The colour of the disc is black with no title information on it beside basic copyright information. Notes: Only about 50 of these CDR promos were produced by Virgin Records. Notes: This is a audio recording of an interview between 3D, Daddy G and Mushroom and a unnamed journalist that was recorded in March 1998, concerned mainly about the then upcoming release of Mezzanine. 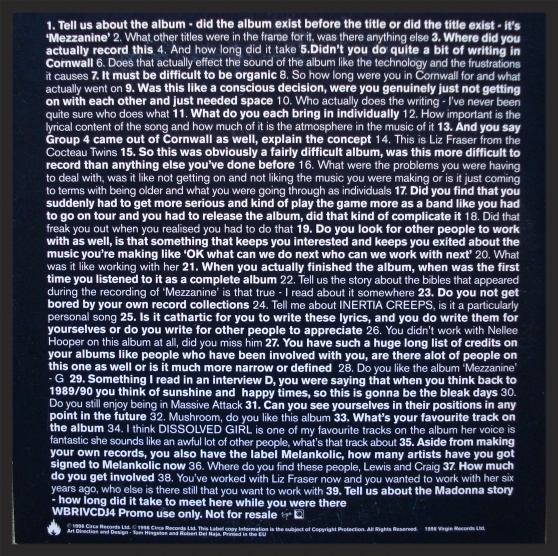 The journalist's voice does not feature on the CD; it is just Massive Attack answering the questions. There is a tracklisting discrepancy between what is printed and what questions are answered on the CD. For track 14, the question 'This is Liz Frazer from the Cocteau Twins?' is printed but the following printed question is answered. This is continued until track 34, where there is an unknown question answered. Listen to the entire interview on YouTube.